Welcome to our NHL Stanley Cup Odds And Futures page. This page deals with Stanley Cup odds, NHL conference betting odds, Hart Trophy odds, that kind of thing. Every couple of weeks, we update the NHL Stanley Cup odds from Sports Interaction and weigh in on what teams might be currently offering some value and which aren’t. If you can correctly predict the Stanley Cup winner during the regular season, you can really cash in on some huge prices. We’ll also list the updated Western Conference betting odds and Eastern Conference betting odds, which allow you to bet on who will reach the Cup final instead of who will win the Cup. It’s one less round you have to win to cash your bet. 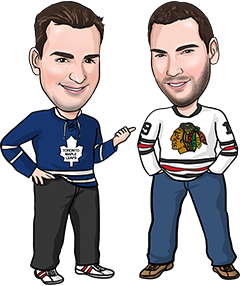 If you’re not sure what NHL futures odds are or how to bet them, check out our article on betting NHL props. The Canadiens’ stock is sky high right now as the Habs have yet to lose in regulation time at home (10-0-1) and have earned points in 15 of their first 17 games (13-2-1-1). 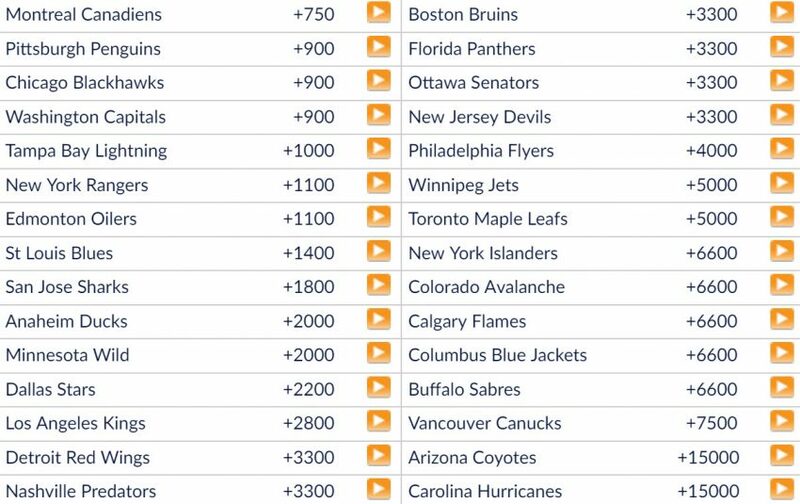 If you haven’t already bet on Montreal to win the Cup, you’ve missed the boat on the best Stanley Cup odds as the Canadiens paid as high as +2000 last summer. Montreal’s pace appears unsustainable. They rank third in the NHL in both goals for and goals against, but they’re 27th in the NHL in both shots for and shots against. The Canadiens’ record might also be a bit inflated by the fact that they’ve played 11 of their first 17 games at home. Montreal is certainly a legitimate Cup contender as long as Carey Price remains healthy, but we can’t quite buy into them being the favourite. The defending Cup champions got off to a 10-3-2 start despite playing their first 6 games of the year without Sidney Crosby. Pittsburgh is 7-1-1 since its captain returned to the lineup, with Crosby scoring 10 goals in those 9 games. Evgeni Malkin is also off to a good start with 15 points in 15 games. And goaltender Matt Murray is back to his old form, going 4-0 with a 1.25 GAA in his first 4 starts of the year after missing the start of the season due to injury. Pittsburgh’s offence might be a bit too reliant on its top 3 guys, however. Crosby, Malkin and Patric Hornqvist have combined to score half of the Penguins’ 46 goals in their first 15 games. The Blackhawks have recovered from some early struggles to take back their usual spot near the top of the Stanley Cup odds. After opening the year with 3 losses in its first 5 games, Chicago earned points in 11 straight games (9-0-2) before that run was snapped with a 4-0 loss in Winnipeg. Chicago ranks sixth in the NHL in goals per game (3.1), but the more impressive stat might be how the Hawks are 12th in goals against per game (2.5) despite having the NHL’s worst penalty-killing unit (67.3%). At even strength, Chicago is playing very good defensive hockey, and that penalty killing percentage will only get better as the year goes on. Like Montreal, however, the Blackhawks’ early season record (11-4-1-1) might have been a bit skewed by the fact they played 11 of their first 17 games at home. The Capitals haven’t been nearly as dominant this year as they were last season, when they won the President’s Trophy by 11 points. They rank 7th in goals allowed per game (2.1) after ranking second in that category last year, and Washington’s offence is 18th at 2.5 games per contest. It’s possible that the Caps are suffering from a bit of a hangover after last year’s playoff disappointment. New York has filled the net early this season, averaging 4 goals per game through the first quarter of the campaign. Will that continue? Almost definitely not at this pace, considering the Rangers’ team shooting percentage is a whopping 13.67% and will certainly regress as the season goes along. But with Henrik Lundqvist in net and a decent defence corps in front of him, the Rangers don’t need 4 goals per game to continue their winning ways. It was great to see the Oilers off to a fast 5-1 start. They’re exciting and young and have an absolute phenom in Connor McDavid. But they’ve since come back down to earth, losing 7 of 9 earlier this month. Edmonton allowed 33+ shots per game through its first 6, and it’s hard to win a Cup when you just rely on offence every night. After potting 12 goals in its first 2 games, the Oilers’ offence has slowed as well, averaging less than 2.5 goals per outing. Considering that Edmonton’s chances of making the playoffs before the year began were basically 50%, we’d like to see them make the post-season before we’re ready to consider them a top-10 Cup contender.